The Round Lake Beach Cultural & Civic Center hosts regular Fireside Chats, through which the Village of Round Lake Beach brings county, state, and federal officials closer to local residents. The evenings begin at 6:00 p.m. with a Meet and Greet, followed by an informal conversation between the featured guest, Mayor Hill, and guest moderators from 6:30 to 7:15 p.m. Residents have the opportunity to participate in a Q&A session from 7:15 to 7:30 pm. Coffee and desserts are provided, compliments of the Village. On February 20th, join us to learn about the Illinois Municipal League with Executive Director Brad Cole. The Illinois Municipal League is the formal voice for 1,298 Illinois municipalities. The League’s mission is to articulate, defend, maintain, and promote the interests and concerns of Illinois communities. 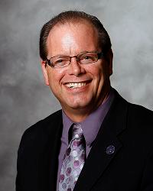 Brad Cole has been with the Illinois Municipal League since December 2014 and will speak about issues facing municipalities throughout the state.